When Yuzhong Wang first began attending classes at Emory University School of Law last year, he found himself understanding about 70 percent of what was being said in the classroom. "In many cases, I could guess what I was missing, but law is complicated and during the first months it could be difficult to follow," he recalls. Although Wang had studied English since he began attending primary school in China and had worked with English-speaking clients at a Shanghai-based law firm, he realized his conversational skills had room for improvement. So when an invitation to learn more about Emory's Conversation Partner Program appeared in his email inbox last year, he decided to look into it. Offered through Campus Life's Office of International Student Life (OISL), the volunteer program pairs international students, staff and faculty with undergraduate and graduate students, staff and faculty from the United States to help practice conversational English, says Allison Olmsted 15C, an OISL fellow who participated in the program as an Emory undergraduate and now helps coordinate it. The program — which pairs participants for one semester at a time — offers international participants a chance to practice language skills in a relaxed, friendly setting, and also breaks down social and cultural barriers, allowing both partners to learn about new cultures, share worldviews, and in many cases make a friend. "I think it's always beneficial to get to know someone who is different from you," says Olmsted, who continues her participation in the program as an Emory staff member. "It encourages you to look at things in a different way, to learn about others and also to learn more about yourself." During Fall 2015, the program drew some 325 volunteer participants, and interest across campus has been on the rise. "But there's still a lot of room for growth," Olmsted notes. Applications for Spring 2016 partnerships will be accepted through Jan. 24, with conversational pairings to be announced by Feb. 2. 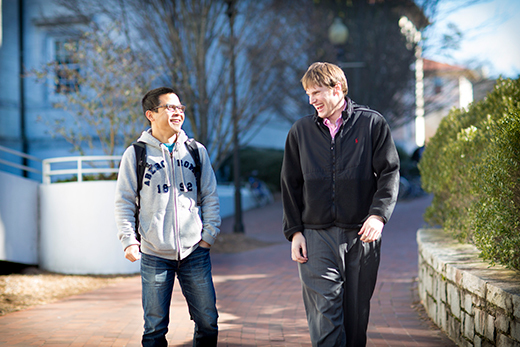 Emory's Conversation Partner Program was launched two years ago by OISL Director Natalie Cruz, who had participated in a similar program as an undergraduate at Clemson University, and Jane O'Connor, director of the Emory College ESL Program. As a sophomore, Cruz recalls being paired with a physics PhD student from Iran, "someone I probably never would have met outside of the program," she acknowledges. "It was so inspiring and amazing to get to know him," she says. "He taught me how to play a traditional Iranian musical instrument, he met my family, and even came to my wedding. Some 12 or 13 years later, we still keep in touch." When Cruz helped launch the OISL in 2013, she first surveyed international students at Emory and created a student advisory board to discuss their experiences on campus. "What I kept hearing from international students — and it's honestly a nationwide trend — was that they wanted more relationships with domestic students," Cruz says. "It was easy to form relationships with students from their own countries and culture, but it's a shame if they come here and don't have the opportunity to engage with everyone." Cruz saw that language barriers and cultural difference could sometimes get in the way of normal peer-to-peer relationships. With the Conversation Partner Program, "the idea was to help provide a platform for those relationships to flourish," she says. "The climate was right for it at Emory, and since then we've seen some really great friendships develop, which is incredible to watch unfold." Program participants are asked to complete a one-hour training session and commit to meeting with their partners a minimum of an hour a week, once a week ideally. Questionnaires help pair partners by age, interests, and a variety of other factors. "As with any program like this, there can be matches that don't work out or people who get too busy to have time for it," acknowledges Cruz. "We do our best to re-match people if needed, but on the whole, we hear really positive things and are learning first-hand from participants that they're having experiences they wouldn't have otherwise," she adds. Cruz stresses that benefits of the program cut both ways. "It's really not so much about just helping international participants but more about highlighting and leveraging the strengths that they bring to Emory," she says. "They are a really important part of our community," she says. "Let's encourage them to get involved on campus and share their wealth of knowledge." Through the program, Wang was eventually paired with Jay Page BBA12, an Emory staff member who works on a strategic initiatives team at Emory School of Medicine. Neither knew what to expect, but the program helped break the ice with some casual social events. Together, they began meeting on campus once a week — often over a lunch and conversation about their lives, backgrounds and cultures, sports and food. In time, Wang was inviting Page over for a home-cooked meal and to meet his wife and daughter, and Page was taking Wang to an Atlanta Hawks basketball game and a University of Georgia-Georgia Tech football game. The experience has created a connection both men anticipate maintaining, even after Wang returns to China. "It's not like one person teaching the other, it's more like creating a friendship — a bond that will last beyond the program," Page says. "For me, that personal aspect was important. I've loved learning more about him and his culture. Definitely an experience I would recommend." For Wang, who's now completed Emory Law's Master of Laws (LLM) program, having conversations outside the classroom would eventually prove to help him inside the classroom. At the moment, Wang is preparing to take the New York bar exam, which will help him better serve international clients when he returns to his Shanghai law firm later this year. Those casual campus conversations? He fully expects they will help him in the workplace, too.